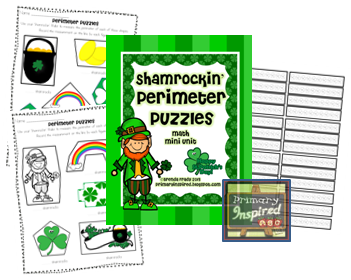 Primary Inspired: Shamrockin' Perimeter FREEBIE! Today was a SNOW DAY for me! A little bummed that we'll lose another day of our Spring Break, but excited that I got to sleep in (yay! ), do some house cleaning (did I say excited? Oh well-- I had to get done sometime), and finish up this little freebie. (Just click the picture above to snag your freebie!!) I just ask that after you download, please leave some feedback! We have been working on both area and perimeter, and this will be a fun little activity (maybe even an assessment) for them. 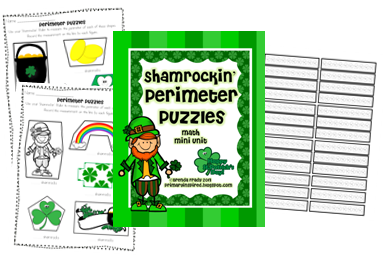 Each little kiddo will get their own shamrock ruler and measure the shapes in terms of Shamrocks. There are two different activity sheets you can use, too. 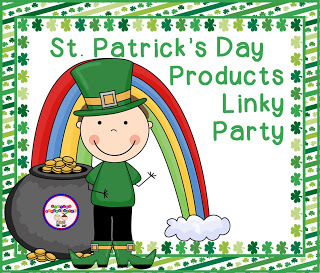 I've linked up with Sharing Kindergarten's St. Patrick's Day Product Linky. Make sure you stop by and check out all of the product that have been linked up. And while we're talking about St. Patrick's Day. . . I'm hosting a pinning party!! 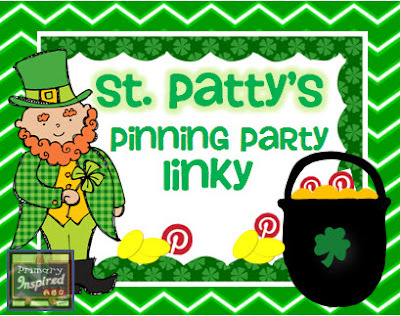 Have linked up your St. Patty's Pin Board yet? Have you checked out all the boards that have already linked up? Make sure you do! I've found so many more terrific pins to add to my board! This is terrific! Thanks so much for sharing!